I’ve just finished up my last convo of the evening and I just wanted to plant a wet beery kiss upon everyone who took time out of their lives to not only look at my work, but send me messages telling me how much they liked it! I’m totally overcome, I tell ya. Anyway, thank you all so much. You all seriously made my last couple of days! 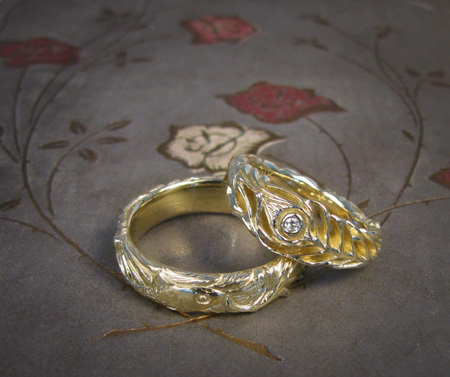 Mostly I do rings. But, I have a soft spot for necklaces. And pearls. Pearls and necks make a great combination. 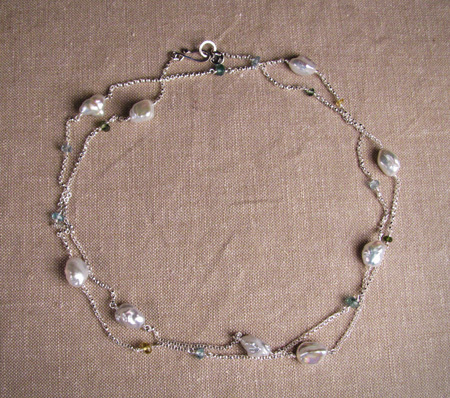 This is a strand of Chinese freshwater stick pearls knotted on silk; it has a hand-made box-style clasp with a Peruvian opal set into it. Stick pearls are just about the awesomest thing ever. They are so intensely iridescent because they are made entirely of nacre (The Shiny). 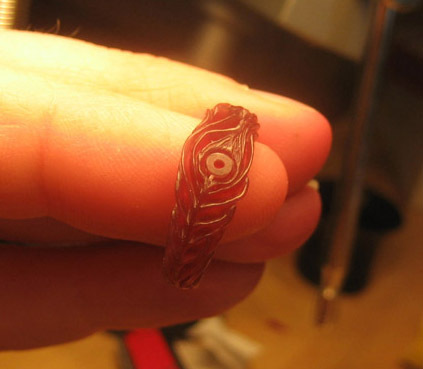 They are created by inserting a bit of mantle tissue into a freshwater mussel. The mussel begins to coat the irritating invader with nacre in an attempt to neutralize it. The mantle tissue breaks down entirely but the mollusk continues to layer and layer bright shiny nacre over what is now a long skinny pearl. They make the coolest sound when they clink together, a bright watery sound. I love Chinese freshwater pearls. Not only are the mussels prolific (and thereby delightfully affordable–you can nucleate a single freshwater mussel with upwards of 30 bits of mantle tissue, thereby creating 30 pearls), but they have a wide range of amazing colors and shapes. Ivory white to pinks are particularly beautiful. The strand above is a range of pinks, from bright orangy coral to dusty rose, and all natural color. 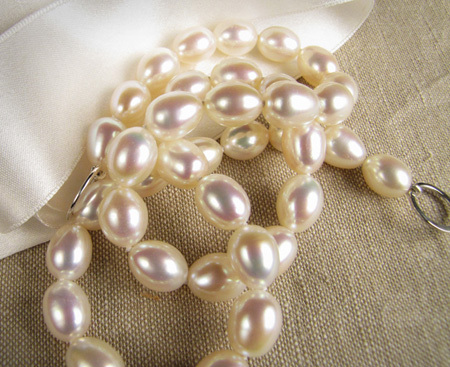 More Chinese freshwater pearls, this time “potato” pearls, so-called because of their oval shape. 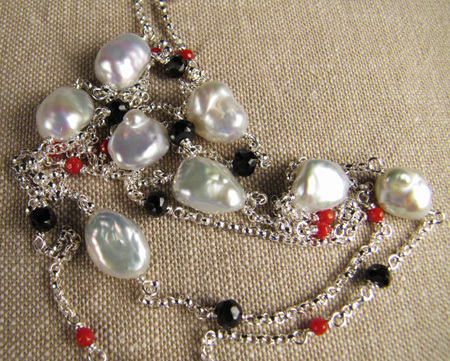 This is a double strand (meant to loop twice about the neck at choker length, or be worn long) with Chinese freshwater keshi, faceted black spinel (a naturally occurring color), and tiny faceted pieces of coral. I find the black, red, and white colors striking and intense. Keshi is interesting in that it is a pearl formed without nucleation. 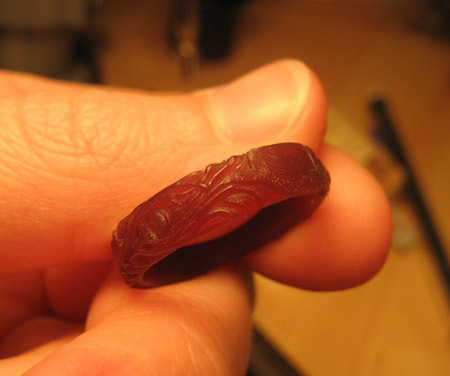 It is about as close to a so-called “natural” pearl that there is nowadays. However, there is a big difference in that instead of Joe Diver happening upon an oyster in the wild, popping it open and LO! 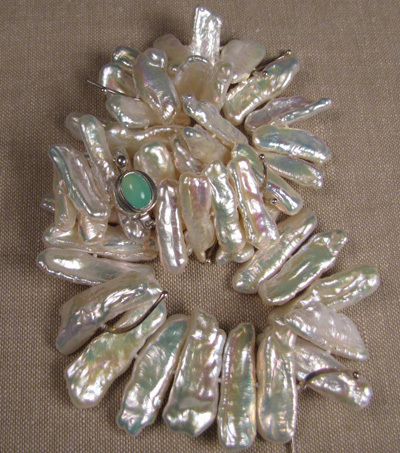 a beautiful pearl, they are created in cultivated oysters. Usually, once a freshwater mussel has had all its cultured pearls removed (created by the insertion of mantle tissue), it is popped back in the water. Because the spots in its mantle are still very irritated after having the pearls removed, it continues to produce nacre and in most instances, this nacre sticks together to begin yet another pearl–this time solid nacre. They are beautiful. It probably goes without saying: Pearls are probably not for vegans or anyone politically vegetarian. 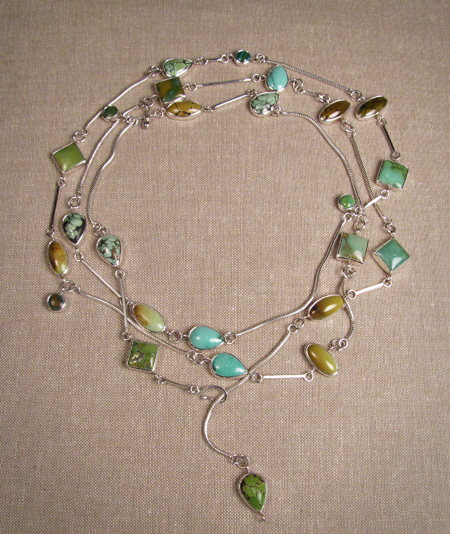 This is the same style necklace as above but using faceted multi-colored tourmaline and aquamarines with the freshwater keshi. 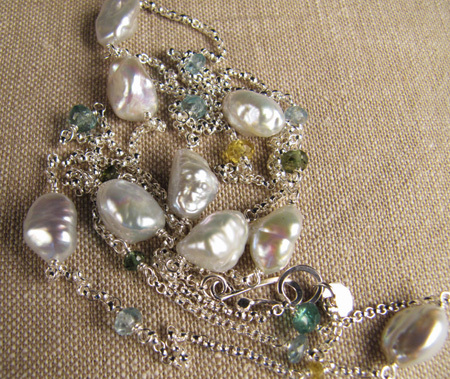 The icy blues and greens really set off the iridescent colors of the pearls. 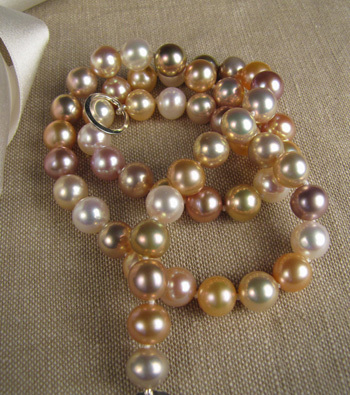 These are also Chinese freshwater pearls, but they are not a natural color. Originally, they were probably an undesirable brownish or grayish color, so they irradiated them. Now they are intensely black/bronze with serious iridescence. I think they are awesome. 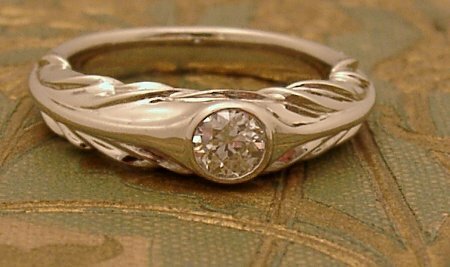 I strung them on sterling silver that has been patinaed a deep steely gray and sprinkled a couple of champagne-colored Austrian crystals here and there. Okay, we’re done with pearls for now. Here are a couple of super long strands made from sterling silver and gorgeous Chinese turquoises. 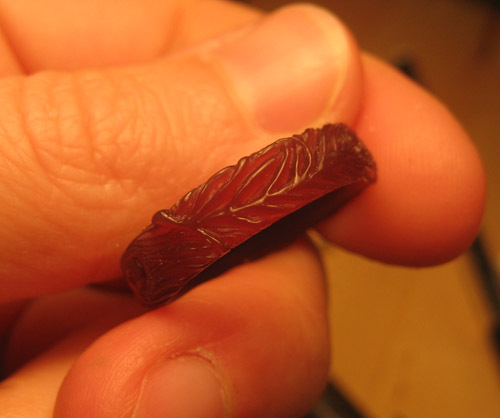 This strand can be worn long, wrapped around the neck once or twice or three times, in a long Y-style, etc. 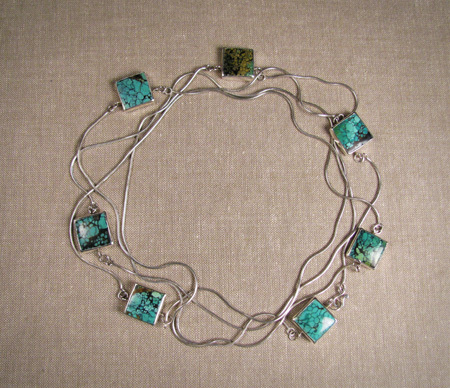 Another super long strand, this time using square turquoise pieces. This can also be looped once or more times about the neck. I’m working on getting the rest of my photos in order for all of the above pieces. I plan to list these (and a couple of others) in my Etsy shop in the next week or two. A fish and a feather. Ooh! 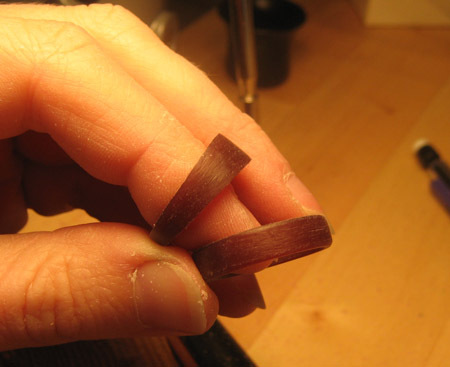 I really had a fun time carving these rings. 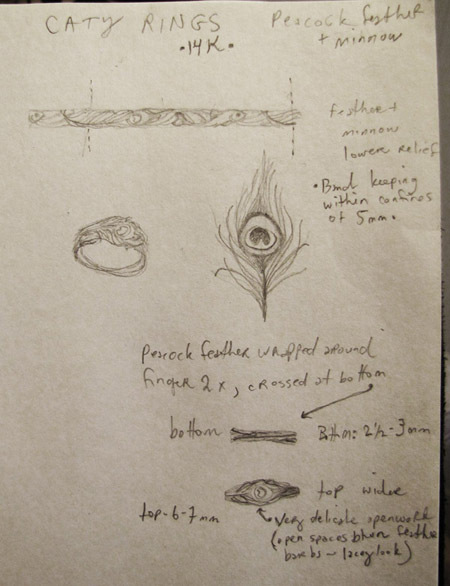 A while back I sketched a design for a big ol’ peacock ring (peacocktail ring?) 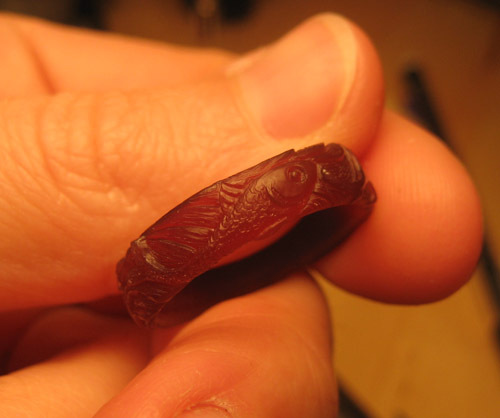 but never got around to actually carving it. 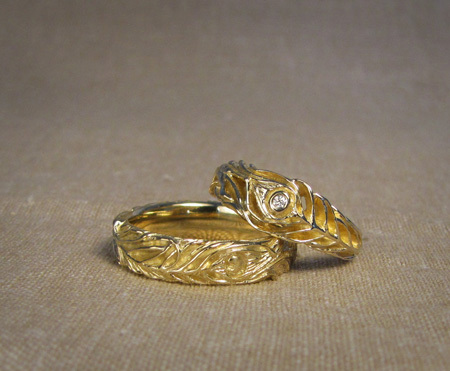 Maybe I’ll dig it back out now because I love how the feather motif worked on the ring. I start out evenly: cut waxes, cut out basic shape with file, scratch in design with something scratchy… Then I go to town. 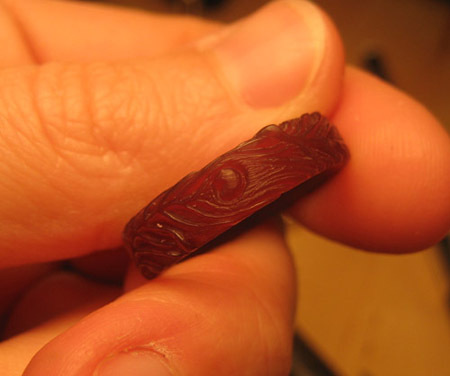 I try to keep continuity by carving on both rings, not getting ahead too far on one or the other, but inevitably at some point I lose myself and focus on one ring until I’m essentially finished. 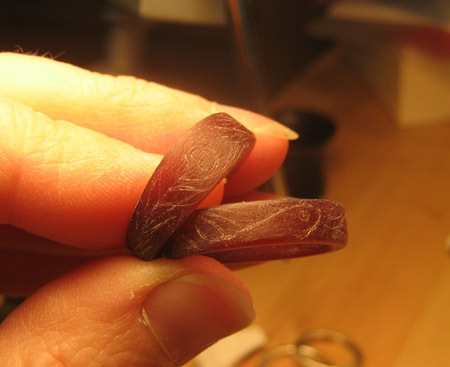 As usual, I carved the first ring (hers) and looked at my rough scratches on the second ring (his) and said to myself: “Oh bother; how can I make this one as good as the first?” This happens every time. And every time the same thing happens. 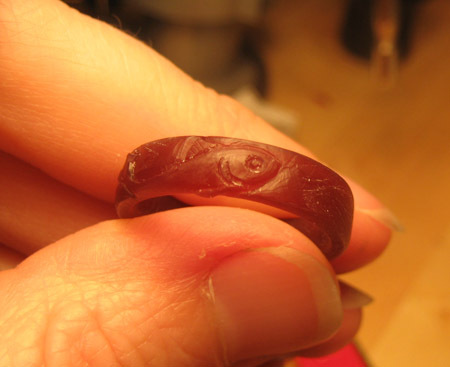 I carve the second ring… and I like it even better than the first. 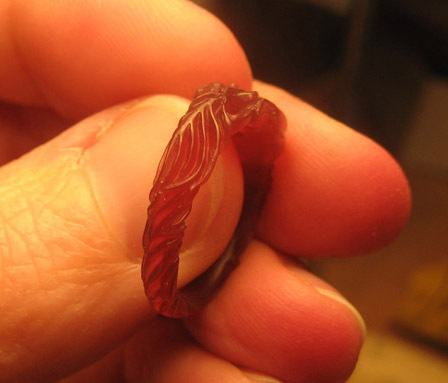 Then I feel bad for the first ring. Because they both turned out perfectly.